Baoding balls are believed to have originated from Baoding town in Heibei province in China sometime during the Ming dynasty. People and soldiers would use a couple of walnuts to exercise their hands until iron balls were created. There are still workmen and artisans in the town who meticulously produce the Baoding balls in the market today. Baoding balls are dubbed one of the “three treasures” of Baoding and are known to have been used by people from all classes of society. Even emperors have been known to use them. 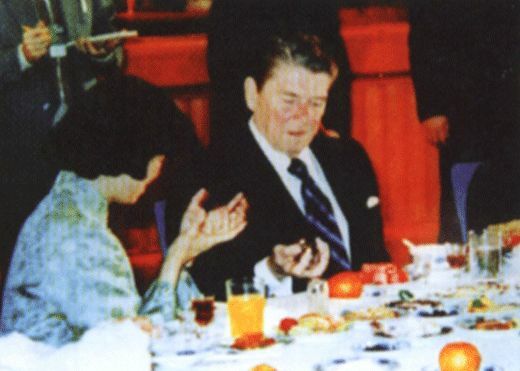 Ronald Regan receiving Baoding Balls. A treasure of Baoding. In the Baoding city, the Baoding balls are known as Iron Balls, since at first artisans relied on iron to produce the balls. The iron balls reportedly doubled as weapons at that time. However, they are presently made from different kinds of materials such as solid jade and solid stone, though chrome-plated steel remains the predominant material used. Such steel balls are light and hollow, plus may contain a chime inside so that when the balls are manipulated they create a nice sound. 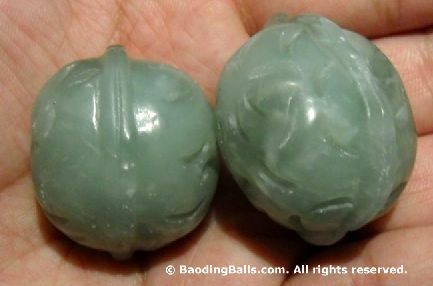 Jade walnuts. Walnuts were used before the discovery of metal. Baoding Balls are made mainly from metal or stone. Metal balls are the choice for most users. Their medium weight and durability make them good for all-around exercises and skill levels. Metal also allows the craftsman to design the balls by engraving the balls or through cloisonne designs. Stone balls are solid and heavier. Thus, using stone balls is more of a workout. If you choose to use stone balls, you need to be careful not to drop them because they are more likely to chip or break. Baoding balls are generally sized differently depending on who will use that size. For the general public, a ball may have a diameter of 35 millimeters to 55 millimeters, though 35 millimeters is adequate for children and 55 millimeters for tall men. Average people should stick with the 37 to 47 mm balls. An advanced user will use multiple sizes of balls. For example, they could rotate 4 small balls in one hand or rotate 2 small balls around a large ball. When selecting the balls which are appropriate for you, check their size and weight. As a rule, the larger and heavier balls have a more invigorating effect on acupuncture points and the reflexes. It is recommended though that you begin with small balls. In time, you will get used to rotating these and can move up to larger sizes, as well as usage at one time of 3 to 4 balls. The Baoding ball is also known by the following names: Baichi (valuable balls), Reflex Balls, Miracle Balls, Iron Balls, Cloisonne Balls, Meditation Balls, Qigong Balls, Chiming Balls, Exercise Balls, Therapeutic Balls, Therapy Balls, Melody Balls, Relaxation Balls, Stress Balls, and Worry Balls.